Drivers make more mistakes when talking on a cell phone than when talking to passengers, new research shows. This finding addresses the common question about whether driver distraction comes from cell-phone use specifically or conversation generally. A full report appears in the December issue of the Journal of Experimental Psychology: Applied, published by the American Psychological Association. Even when drivers used a hands-free cell phone, driving performance was significantly compromised. "Cell phone and passenger conversation differ in their impact on a driver's performance; these differences are apparent at the operational, tactical, and strategic levels of performance," the researchers wrote. The study, led by Frank Drews, PhD, of the University of Utah, analyzed the driving performance of 41 mostly young adult drivers paired with 41 friends who served as conversation partners. Both sexes were equally represented. In each of three experimental conditions (conversation with hands-free cell phone, conversation in the car, or no conversation), one person in each pair was randomly selected to be the "driver" and the other the conversation partner. 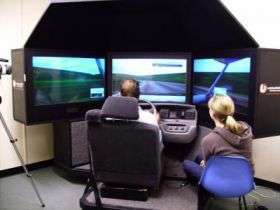 Drivers used a sophisticated simulator that presented a 24-mile multilane highway with on- and off-ramps, overpasses and two-lane traffic in each direction. Participants drove under an irregular-flow condition that mimics real highway conditions -- with other vehicles, in compliance with traffic laws, changing lanes and speeds. This context required "drivers" to pay attention to surrounding traffic. In the cell-phone conversation condition, drivers' conversation partners were at another location. In the in-car conversation condition, partners sat next to their (simulated) drivers. In both cases, conversation partners were told to tell one another a previously undisclosed "close call" story about a time their lives were threatened. All drivers were instructed to leave the simulated highway once they arrived at a rest area about eight miles from the starting point. Partners were told the driver had this task. The driving sequences took about 10 minutes to finish. Drivers talking by cell phone drove significantly worse than drivers talking to passengers. The cell-phone users were more likely to drift in their lane, kept a greater distance between their car and the car in front, and were four times more likely to miss pulling off the highway at the rest area. Passenger conversation barely affected all three measures. The authors said the problems could have stemmed from inattention "blindness," or insufficient processing of information from the driving environment. Cell-phone users may also have found it harder to hold in working memory the intent to exit at the rest area. Conversation analyses revealed some interesting patterns, according to the researchers. When driving tasks got more complicated, drivers appeared to modulate the complexity of their speech, as measured by syllables-per-word. Drivers also talked more when using cell phones, perhaps, the authors speculated, because they were trying to control the conversation to avoid using the mental resources required to really listen to the other person. Meanwhile, passengers took an active role in supporting the driver, often talking about surrounding traffic. That shared situational awareness could be helpful to the driver. Article: "Passenger and Cell Phone Conversations in Simulated Driving," Frank A. Drews, PhD, Monisha Pasupathi, PhD, and David L. Strayer, PhD; Journal of Experimental Psychology: Applied, Vol. 14, No. 4. You'd think that with 6 fingers per hand, morpharse would be able to type properly.